It’s one thing to run off at the mouth and sound big on the interwebs – quite another to be tough in real life. Just ask Zachary Chesser — he talked a big game on RevolutionMuslim and Mujahiblog and God only knows where else, but when he was arrested for giving assistance to a terrorist organization he folded like a cheap suit. IslamicJihadi thinks she’s so tough going after me and Pam Geller. Nice. Take on a bunch of women. REAL tough girl, she is. Even the Canadians are laughing! For those that are interested you can catch Dr. Terry Jones, on CNN tonight at 8:30 PM. He is the founder of the new book “Islam is of the Devil”, and the “International Burn a Koran Day”, which will take place on 9/11. Dr. Jones will be interviewed by Rick Sanchez. Dr. Terry Jones of the Dove World Outreach Center is the guy that tweeter (aka Twit) IslamicJihadi started her litany of “duas” with. As posted here, IslamicJihadi made dua that the Dove World Outreach Center would burn to the ground, and that Pamela Geller of Atlas Shrugs, Me and all Zionist bloggers would be executed. Sweet gal, huh? Word I get is that authorities who know how to find her know where to look. Like I said before – watch your six, sister! 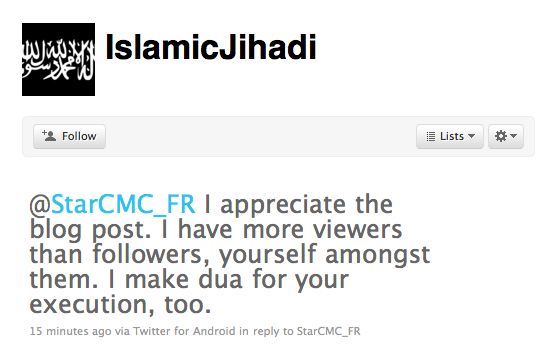 H/T to ImFlippinTheRaya for saving a screen cap of @IslamicJihadi’s nonsense. Thank you very much! Bwaaahahahahaaaa! We are not confused. You pulled the tweet because you thought that let you get away with your idiocy. What are you? Twelve? Does mommy know you’re using the computer again? You know what I find intriguing? Zachie-boy’s legal team. Chesser is schedule for a hearing on Friday in US District Court in Alexandria, Va., to determine whether he should be released on bond or held in jail pending trial. He is being represented by lawyers with the federal public defender’s office. I really would have thought that Linda G Richard would have stepped in to represent him – I mean, she’s smart enough to put together a facebook page hitlist. Maybe she isn’t licensed to practice in Virginia. Or Oregon. Or anywhere. This little twit at Twitter who calls herself “IslamicJihadi” has really been working herself up into a lather. Calling for her radical followers (all 16 of them with equally stupid names) to “make dua” (is that like “making water?”) for a church in Florida to burn down and now for the execution of Pamela Geller. IJ must have been taking lessons from good ol’ Zackie-boy on how to call for the death of people. Wonder if she’ll follow his example right into the hands of the FBI? It would be sweet, that’s for sure. Maybe she’s waiting in the basement of mama’s house somewhere in Virginia or in an apartment paid for by a rich daddy or even possibly the taxpayers of this country just like Zack was, too. I’m sure the FBI knows exactly where to look. Better watch your six, sister. LOL! I’mFlippinTheRaya has tons more on this moron and has been keeping an eye on her a lot longer than I have. Obviously I am not posting screencaps of schematics or materials needed. Now I can understand how videos like these are uploaded to YouTube. I can even understand how they manage to stay there for a while. But when someone takes notice and flags the video according to YouTube’s community policing police, alerting YouTube to the fact that it exists in violation of their TOS, you would think that they would be responsive enough to remove it. I wonder how many explosive devices will be built from these schematics? How many people killed? This video has been saved and documented for the authorities. There is no reason for YouTube to allow this video to remain on it’s server, unless it supports the content. One can only wonder…. Related post at Quoth The Raven. The first is Zachary Chesser, a spoiled rotten kid from Virginia. From what I am hearing on the street, the kid’s parents did everything for him — sent him to the right schools, picked up the tab for his time at George Mason University (not inexpensive – the chart I checked put it at $16,000+ if he lived at home or $21,000 if he lived in the residence halls.) I have written about him ad nauseum. He called for the death — oh wait — warned of the impending death the South Park guys for their depiction of Mohammed. He bragged about how to handle the FBI. By his own admission upon his arrest by the FBI as he was attempting to leave the country to join Shabaab, he isn’t on speaking terms with his parents at this point. He is a traitor to our country and has brought shame to his family. What a waste of youth and vitality. The second Zachary, though, is everything that is right about our country. SGT Zachary Fisher, 24 years old, gave his life for us. Zachary Fisher chose to give of himself. He leaves behind a wife, a mom, a dad, siblings and friends who loved him deeply and will miss him incredibly. He touched his community and brought out the best in everyone who surrounded him. Some might say that this is equally tragic. I would too — except for one thing. 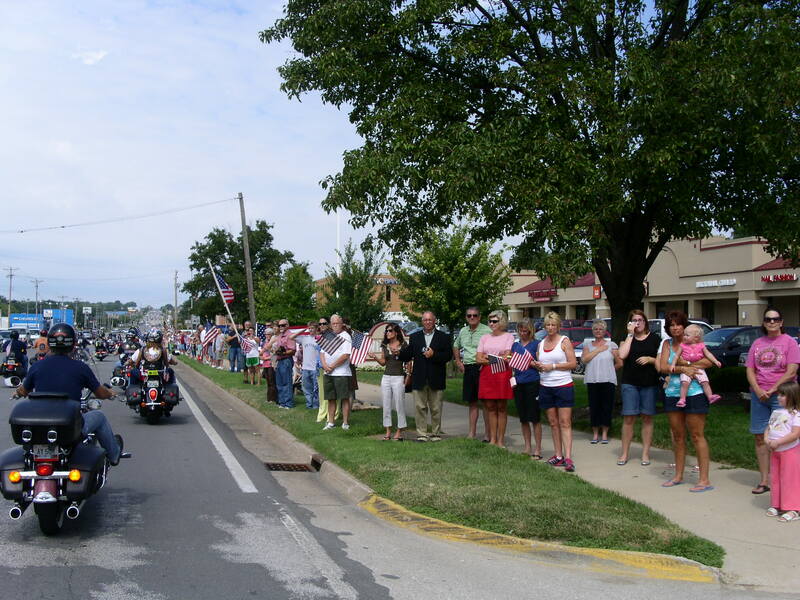 SGT Zachary Fisher brought honor to his family, his men and his community. He is gone, and he will be greatly missed. That is not a tragedy. That is a beautiful testament to a life well lived. Vaya con Dios, SGT Fisher. Heaven needed a hero.